A couple of weekends ago, we were on Camano Island for a family event and we arrived a little early (we were anticipating tulip traffic! ), so we had a few minutes to kill. We decided to let the kids run wild at this little park that we’d passed a million time on the way into Camano, and were so pleased that we did. The playground itself, much like most rotary-funded playgrounds (such as Million Smiles in Lynden) is awesome. 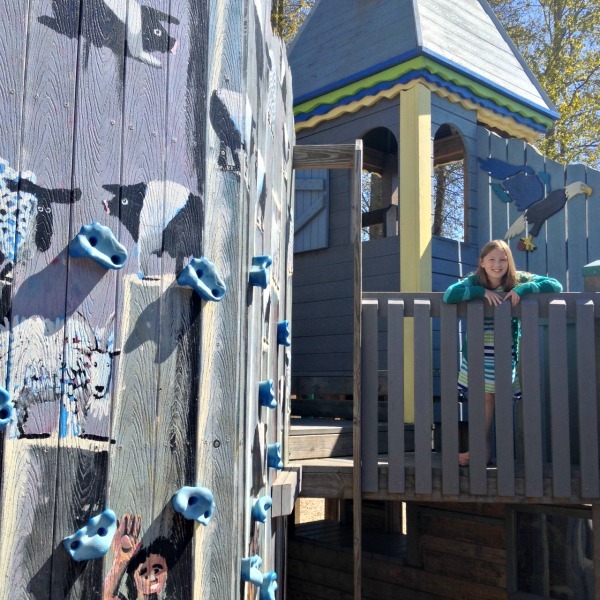 There is a separate fenced-off area for children under age 5 to play, plus, a huge area for older kids, including swings, lots of climbing walls and ropes, and cool fort-like passages and towers to explore. We were only at the playground for about 15-minutes, but I’m pretty sure that we could have spent all afternoon there. Josh and I loved that there were parent-friendly benches all around the play area, so we could kick up our feet and watch the kids play. Plus, the entire playground is fenced in and there is only one exit, both being musts considering the playground is surrounded by a busy highway and since the play area is big and you can’t always have your kids in your line of sight. In between the playground and the parking lot is Freedom Park. 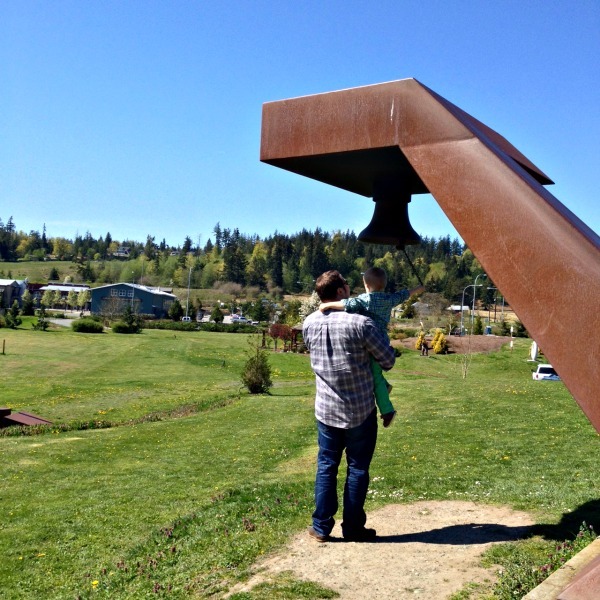 Have your kids run up to the very top of the hill to ring the bell, then check out the pretty view of Camano Island. It sure is gorgeous down there! Be sure to pack a coat for everyone in your family — it always seems to be a bit breezy down there. There are covered picnic tables, if you want to bring snacks or lunch, as well as plenty of grassy spots to throw down a blanket at Freedom Park. It takes about an hour from Bellingham to get to Camano Island. We prefer jumping off of the freeway early and taking the back roads to get there. The drive is prettier and you’ll cut about 15-minutes off of your drive. At the split in the road, you’ll see the park ahead. Stay right onto North Camano Drive. The parking lot is past the playground, on the left. You can read more about the park and playground on their website. What do you love to do in Camano/Stanwood? Any fave places to grab a bite with the kids? 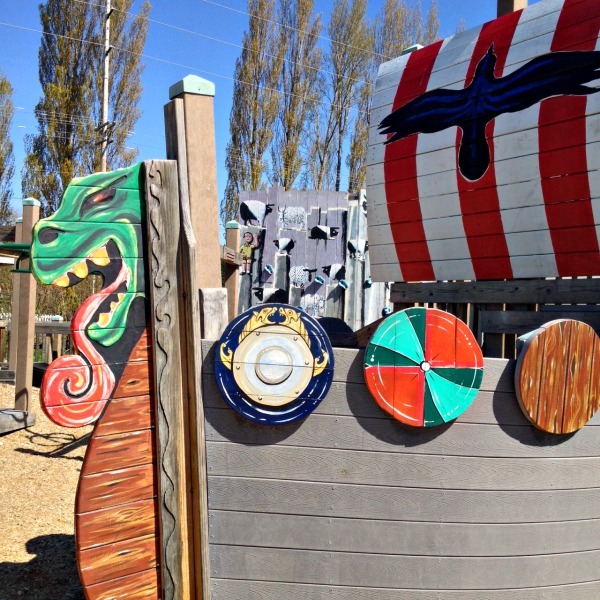 This entry was posted in Day Trips, Get Out of Town and tagged 2014, Camano Island, Day Trips, Parks, Playgrounds, Stanwood on April 23, 2014 by Katie Kavulla. Thanks for sharing this. I’ve been jotting down little day trips to do this summer and just added this one to my list! Yay! It’s such a good little spot and the drive is quick! Enjoy!